Eritrea and Russia have expanded their bilateral relationship with the announcement of trade and a planned ‘logistics hub’, most probably at Eritrea’s Assab port, where the UAE already built a huge naval base. If this ‘Logistics Hub’ went according to plan, it will be Russia’s official presence, along with China and the U.S., on this strategic Red Sea location. The scope, location, and timeline of the project have not been announced, but the diplomatic development is an important milestone for both countries, each of whom has sought to expand its bilateral ties. For Russia, it’s the latest effort to forge alliances with countries in Africa, following multiple trips to the continent this year by Lavrov to discuss military, economic and diplomatic partnerships. 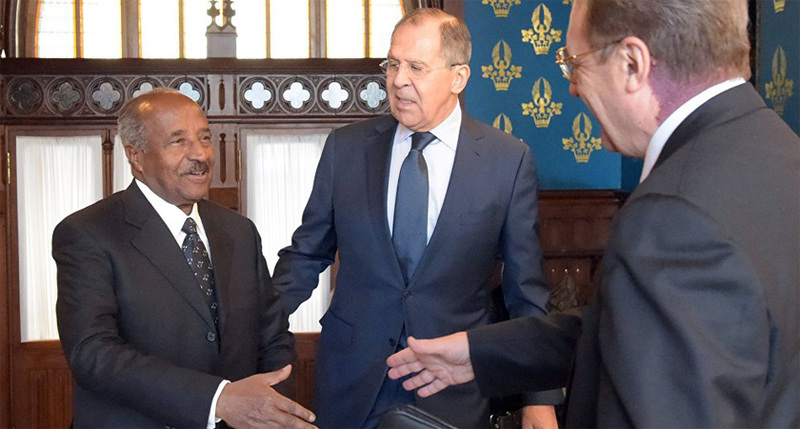 For Eritrea, a deepening Russia alliance is the latest sign that decades of isolation may be ending, after a historic peace deal in July with neighboring Ethiopia. Since that agreement was signed, Eritrea’s president, Isaias Afwerki, has met with leaders from Saudi Arabia, the United Arab Emirates, Somalia and South Sudan. He’s also received delegations from Japan and Germany. For Friday’s meeting, Eritrea sent a delegation led by Foreign Minister Osman Saleh and Yemane Ghebreab, a senior presidential advisor, to Sochi, Russia, about 3,100 kilometers north of the Eritrean capital, Asmara. It’s the latest get-together in the countries’ 25-year diplomatic relationship. Eritrea’s two ports, in Massawa and Assab, occupy strategic points along the Red Sea. Access to those ports is one benefit Ethiopia, a landlocked country, may reap from the peace deal. 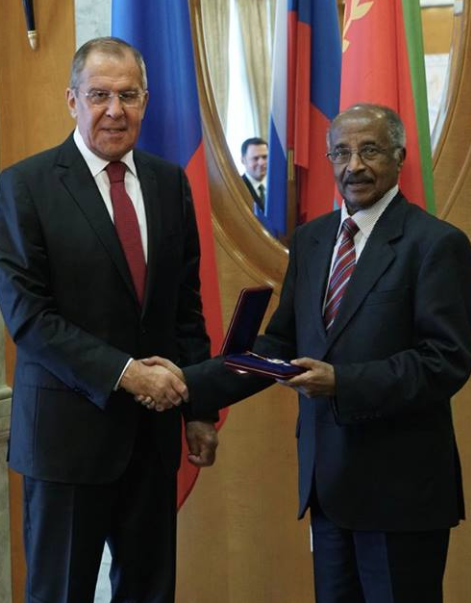 FM Sergey Lavrov presented the Medal of the Foreign Ministry of the Russian Federation to FM Osman for his contribution to the advancement of relations between the two countries and for international diplomacy. Ethiopia and Eritrea began talks about the possibility of joint port development immediately following the deal. Such a cooperation could involve an existing facility or one that hasn’t yet been conceived. 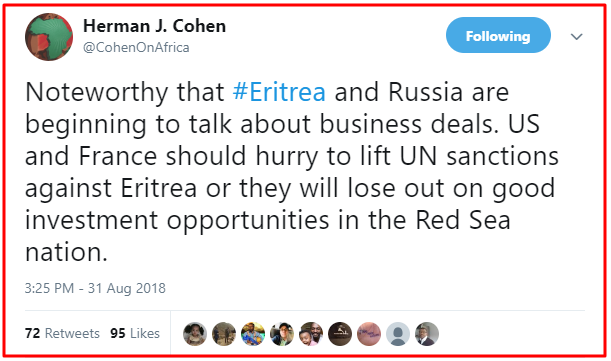 Meanwhile, specifics on the purpose of the planned Russian logistics facility haven’t been announced, but Russian and Eritrean leaders said the project would invigorate trade and business deals between the countries. If Russia follows through on its plans for a logistics center, it won’t be the first time a foreign player has set up shop in Eritrea. Decades earlier, in the 1940s, the United States established a military and logistics base at Kagnew Station in Asmara for reconnaissance missions in World War II and the Cold War. Eritrea faces U.N. sanctions against specific individuals, along with an arms embargo. It’s hoping to use evolving diplomatic relationships to build momentum to remove the penalties. Talk of lifting the sanctions has accelerated since the peace deal with Ethiopia, but Eritrea’s sanctions, in place since 2009, were imposed not because of that conflict, but rather separate concerns with other regional neighbors, including alleged support of al-Shabab in Somalia and a border dispute with Djibouti. The al-Shabab issue is all but settled, with the United Nations deciding last November to disband the monitoring group that was tasked with investigating Eritrea’s links to the armed extremist group, after years of inquiries produced no evidence of ties. Objections over the border with Djibouti, however, have persisted, with Mohamed Siad Doualeh, Djibouti’s ambassador to the United Nations, writing a forceful letter to the U.N. Security Council in late July outlining his country’s grievances, which include occupation of Djiboutian land and prisoners of war who have not been accounted for or returned. Lifting sanctions will require nine of 15 Security Council votes, including the support of all five permanent members — China, France, Russia, the United Kingdom and the United States. It’s the first time a permanent member of the Security Council has addressed the sanctions issue since the peace deal with Ethiopia and, backed by aspirations for bilateral business deals, increases Eritrea’s odds before a potential vote.